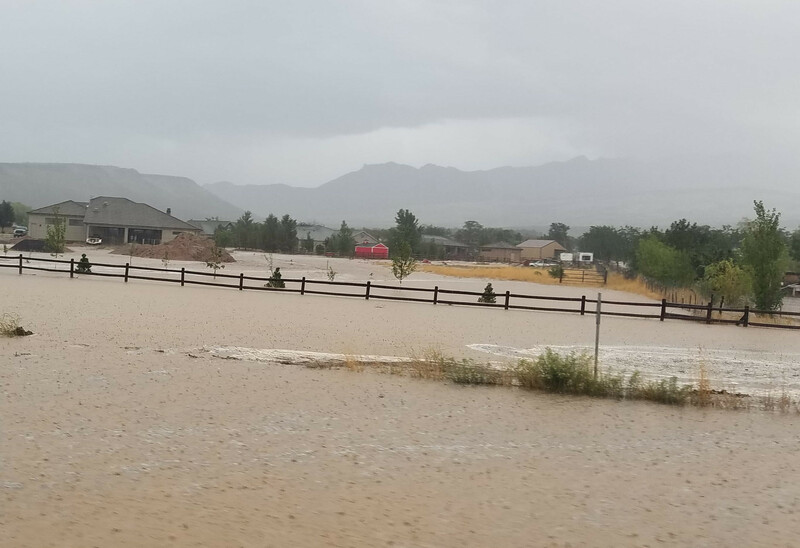 WASHINGTON COUNTY — A storm that swept through Southern Utah Thursday evening resulted in heavy flooding in Dammeron Valley. Heavy rain and hail began beating down on the community along state Route 18 at around 5:30 p.m., quickly leading to flooding in roads and surrounding buildings. As of 9 p.m., an advisory from Washington County Emergency Services reported 18 flooded homes in the Dammeron Valley area. “We are still working to verify if any families have been displaced by the flooding incident and dispatched resources to those in need,” the advisory states. Crews from Washington County Sheriff’s Search and Rescue responded to assist with damage assessment and fill sandbags for affected residences. The initial flooding buried SR-18 in mud and debris, blocking traffic in both northbound and southbound lanes near mile marker 16 for more than an hour as crews cleared the scene. The flooding triggered a response from Washington County Emergency Operations, which included personnel from St. George Fire Department, St. George Streets, Santa Clara-Ivins Fire Department and Public Works, Diamond Valley Fire Department, Dammeron Valley Fire Department, Enterprise Fire Department, Northwest Special Services Fire District and Gold Cross Ambulance. WOW That was a whopper. And not a river. Poor drainage evidently?